WALLACE – Wallace Fire Chief Thomas Townsend was celebrated on Saturday, May 5th. HICKORY – Meet Darlene Huffman, a 32-year veteran of North Carolina’s fire service. CARTERET COUNTY – The remnants of Tropical Storm Beryl still had some punch when it came north though Eastern North Carolina Wednesday, spawning a tornado in Carteret County and dumping heavy rains on Jones and Craven counties. NEW BERN – Fire officials in coordination with the State Bureau of Investigation were trying Tuesday to figure out what caused a massive warehouse fire in downtown New Bern. NEW BERN – Fire erupted in a rented industrial building near downtown New Bern Monday night, sending flames and heavy smoke into the evening sky visible from as far away as Bridgeton. 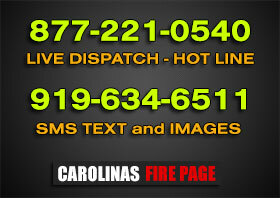 CHARLOTTE – Three people were transported to the hospital this morning after a house caught fire in west Charlotte. KINSTON – Kinston’s two newest fire stations are nearing completion, and firefighters are expected to be ensconced in those facilities by mid-June. SALISBURY – A Salisbury family escaped in their pajamas Wednesday night from a fire that quickly engulfed their rental house at 105 Mitchell Ave.